Though we still have a week or so until it’s official, the summer has — for all intents and purposes — arrived. The weather is warm, the days are long, the sound of lawnmowers fill the evenings, and we naturally find ourselves wanting to spend more time outside. If you are looking for ways to enhance your summer-loving outdoor fun, we may have just the idea — invest in some new landscaping and some features that make your time outside even more enjoyable. Whether you want to improve your outdoor oasis so you have a better place to relax or you want to create a new area where you can entertain this summer, a landscaping project may be the solution. If you are in the Medina or Summit County area, we’d love to help bring your landscaping ideas to life. Learn more about our professional landscapers, our services, and give us a call today to learn more. Here are some landscaping ideas and tips to spruce up any home. Native plants are great for a number of reasons. Not only does it feel like you’re embracing your home’s natural roots, but, perhaps most importantly, native plants often require less watering and maintenance than do exotic species. Over time, this savings can really add up. For some ideas, check out this article by Cleveland.com, which looks at 25 native Ohio perennials. Or have a look at the various resources offered by The Native Plant Society of Northeastern Ohio. Nothing beats summer nights. Don’t cut your nights short because of a lack of light. Whether you want to add ambient, accent, or bright light to your outdoor oasis, installing lighting structures is a great way to highlight landscaping features, like flower beds, gardens, and walkways. Practically speaking, these lights can also provide you and your family with more outdoor lighting. Consider adding spotlights to direct attention toward key landscaping features or decorative lanterns to add a romantic touch to your outdoor oasis. Incorporating structure into your landscaping is a great way to give your outdoor space more of a defined purpose — almost like a room. For example, structural plants and shrubs like boxwood hedges can be the perfect year-round landscaping element to box in your yard or patio area. In addition to enhancing the appearance of your yard, they will also provide great foil for colorful plants. Another possibility may be to add small trees or shrubs, like contoured white pines, that will give your outdoor area shape and intrigue. Gardens are tried-and-true landscaping additions. They not only provide delicious home-grown food, but they also add beauty to homes. If you don’t have time for a traditional edible garden, consider a small hanging edible garden. This doesn’t require a large backyard, and it can yield some great results. Adding hardscaping to your lawn can be a great summer, home improvement project. You can spruce up your yard with a more traditional hardscaping project — fire pit, built-in bench, patio, deck, stone wall, or walkway. 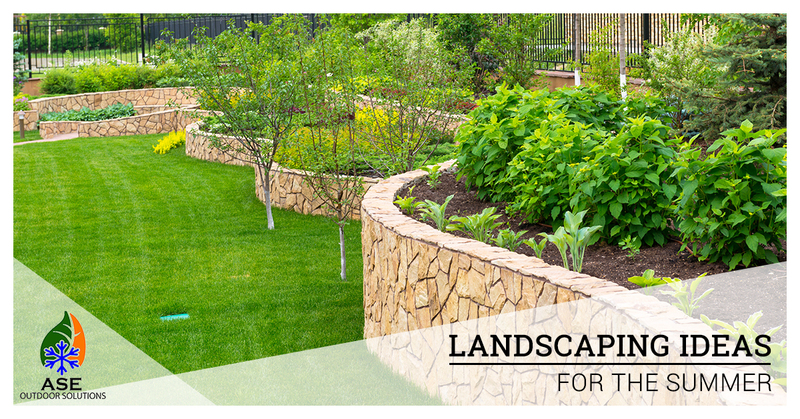 Or you could also incorporate a more natural, hardscaping material to your yard. Instead of the clean, geometric, and modern look of a lot of traditional hardscaping, many homeowners prefer old-fashioned, DIY approaches — or at least materials that appear this way. Either way you go, adding hardscaping can really liven up your outdoor space. Summer is all about water. Accentuate this natural affinity by adding something aquatic to your outdoor oasis. Small features like a tranquil pond or peaceful fountain can make a huge impact on your outside aesthetic. As technology advances, water features are becoming more efficient and accessible than ever. For example, another idea to consider is to implement a sustainable watering system. Advanced irrigation technology has made it possible to better control how much water you deliver to your plants. This type of programmable system is the perfect landscaping idea for the environmentally conscious homeowner. This is, of course, just the tip of the iceberg when it comes to landscaping ideas. If you are having trouble coming up with ideas for your home and you live in Barberton, Medina, Akron, Rittman, or a neighboring city, give us a call at 330-299-4404 to get your free quote!